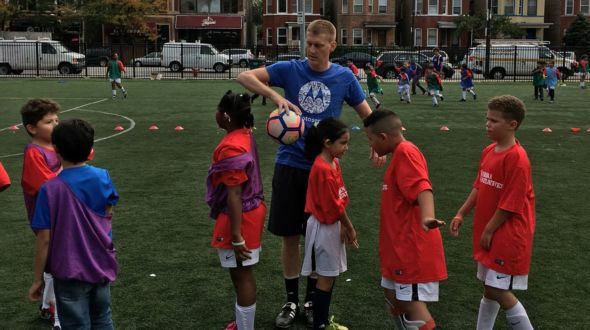 On a beautiful fall afternoon, four volunteers from Motorola Mobility joined Goethe Elementary’s Work to Play squad for a series of scrimmages at Haas Park in Logan Square. The Goethe students were excited for the scrimmages – they had worked hard in practice and in the classroom all week, and this afternoon of friendly competition was their reward. The Motorola volunteers played multiple roles on the field, serving as cheerleaders, coaches, and referees. 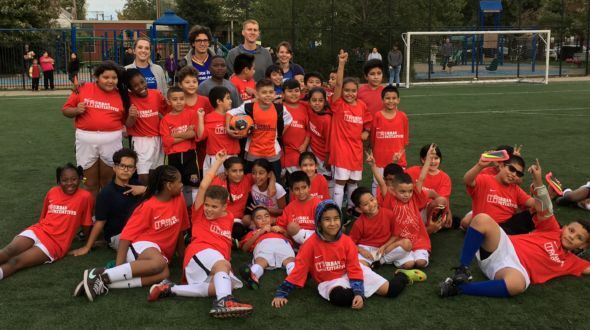 They coached the players on their throw-ins from the sidelines, encouraged the students to spread out across the field rather than bunch up around the soccer ball, and make good passes to their teammates. At the end of the afternoon, each of the coaches selected a player who best exemplified the value that had been highlighted in the Work to Play curriculum all week: respect. These players were recognized for their outstanding conduct on the field and their considerate behavior toward their teammates. Thank you so much to the group from Motorola for taking time out of their afternoons to support our participants at Goethe!